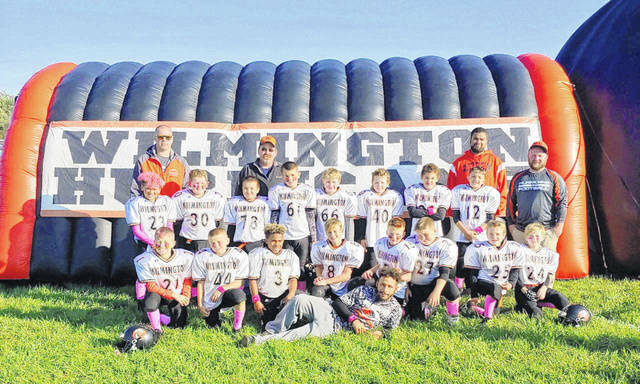 The Wilmington Hurricane Youth Football Program fourth grade team has advanced to the second round of the Western Ohio Junior Football Conference playoffs. The young Hurricane will play at Noon Saturday at Alumni Field. The Wilmington bantam team also advanced to the second round and will play at 9 a.m. Saturday at Alumni Field. Other WOJFC playoff games will also be played at Alumni Field Saturday, featuring third-, fifth- and sixth-grade teams. In the photo of the fourth grade team, from left to right, front, coach Tino Keefer; second row, Ayden Murphy, AJ Kirk, Josiah Puller, Max McCoy, Isaac Newberry, Colton Knisely, Mason Scarberry, Cooper Short; third row, Phayden Mauyer, Ioan Cioca, Matthew Manson, Damion Simpson, Nicholas Clark, Xander Schraw, Devin Cosby, Jared Tackett, coach Ronnie Cummings; back row, head coach James Kirk, coach Matt Short, coach Derrick Cassell. Missing from photo is coach Mike Brown.